Susy Worzencraft warmly welcomes you to Rosemary House. 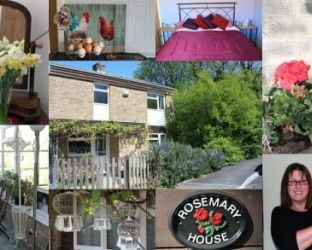 Our family-run friendly B&B and Guest House in a quiet spot close to the center of the picturesque village of Fulbourn just outside Cambridge. We pride ourselves on providing fantastic value for money, a personal touch to your stay, and our delicious Breakfast! Visit Cambridge Cambridgeshire and the surrounding villages and stay in bed and breakfast, hotel or holiday apartment accommodation provided by BedPosts members. Cambridge, population about 110,000, is famed for its university established in 1209. The town is in of the county of Cambridgeshire in East Anglia. The earliest evidence of settlement is from 3500 years ago through the Iron Age, Roman, Saxon and Viking times. Cambridge is one of the most important and beautiful towns not only in East Anglia, but also in Britain and even Europe. The quality of its buildings, in particular those belonging to the University, and the particular atmosphere caused by the felicitous combination of river and gardens have given the city a place in the itinerary of every visitor to this country. The old phrase ‘Town and Gown’ suggests the ancient division, culminating in riots in 1381 during Wat Tyler's revolt, between that part of the city which is devoted to the University and the remainder which is residential and commercial - the city of everyday life in fact. The University has influenced not only the architecture of the town but also its character: its bookshops are among the finest in the country, and the adventurous programmes of the two theatres and several cinemas, the frequency of excellent concerts and the wide range of restaurants reflect the tastes and interests of the academic population. If you seek accommodation near Cambridge in Cambridgeshire you have come to the website of a “club” of providers who offer affordable quality accommodation around UK in hotels, bed and breakfasts, guesthouses, inns, and restaurants plus self-catering cottages and apartments .